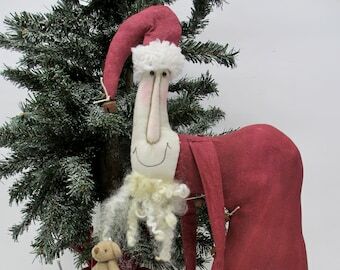 A very unique Primitive Santa doll for your primitive country Christmas decor. 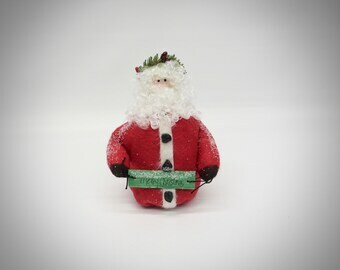 This handmade Santa doll would look perfect greeting your holiday guests or placed within a deep window sill surrounded by greens. Absolute perfection for your primitive country decor. 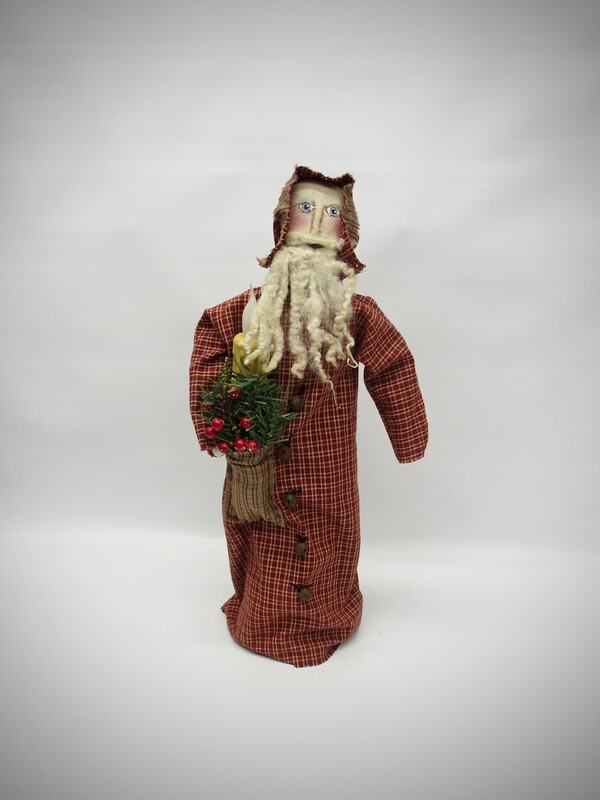 This Primitive Country Santa is dressed in his night shirt and cap made from homespun. His pocket and cap trim is a co ordinated homespun. Down the front of his night shirt are "buttons" of rusty bells. Filling the pocket you will find an assortment of holiday greenery, berries, Sweet Annie and a battery operated candle with 2 AA batteries included. 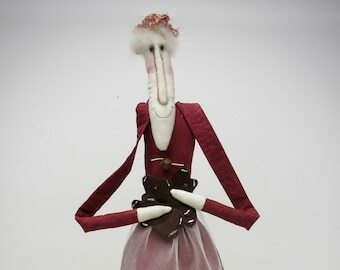 The body is made from stained osnaburg which has been baked. His nose has been hand sculpted. 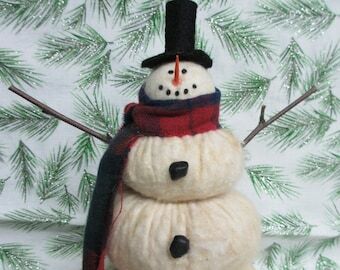 He has needle felted eye brows, hair, moustache and beard. He is nicely weighted which enables him to stand on his own. He stands approximately 14.5" high and is about 5 " wide not including out stretched arm. 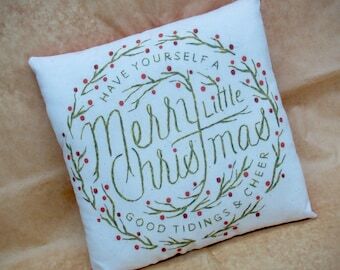 Created from a Hidden in the Attic pattern. We combine shipping. Shipping charges are calculated from New Jersey to California. Any overage of $2.00 or more will be automatically refunded. I collect St Nicks and this is a perfect addition. The lit candle makes it so special! Seller was prompt and courteous. Quality of product is excellent. Would definitely buy from them again! Love this Santa! Highly recommend this seller. You will not be disappointed! Thank you!! 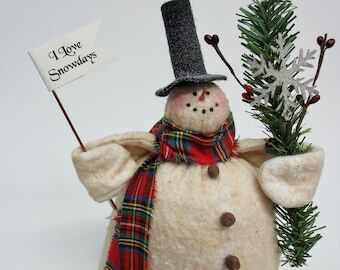 I just love this snowman. I ordered it late in the winter season so only out for a few days. 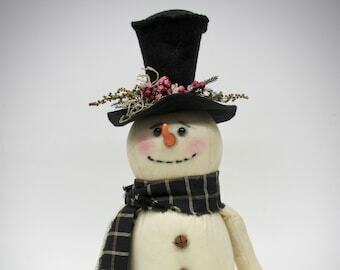 But this shop provides the cutest snowmen. Check it out.